The 2015 edition of ESPN The Magazine’s The Body Issue is out and another 24 athletes will grace its pages in the artistic buff – 23 for the first time. Skier Laird Hamilton is making his second appearance. In the seven editions since The Body Issue’s debut in 2009, only two athletes have appeared more than once: Hamilton in 2009 and 2015 and figure skater Julia Mancuso in 2009 and 2010. Floyd Mayweather bests Manny Pacquiao again – and for the second year in a row tops everybody on Forbes’ annual list of the 100 richest athletes in the world. Mayweather made almost twice as much as Pacquiao in the past 12 months – both the only current nine-figure sportsmen in the world. Together, they brought in nearly half a billion dollars ($300M + $160M). Tiger Woods is the third member of the nine-figure club – he earned $105 million back in 2010 before it all fell apart. Still, Woods ranks ninth today, raking in a “paltry” $50.6 million. According to Forbes, “the blockbuster showdown between boxers Floyd Mayweather and Manny Pacquiao” had most to do with the two boxers’ earnings (duh) – and with the overall increase across the board for the top 100. 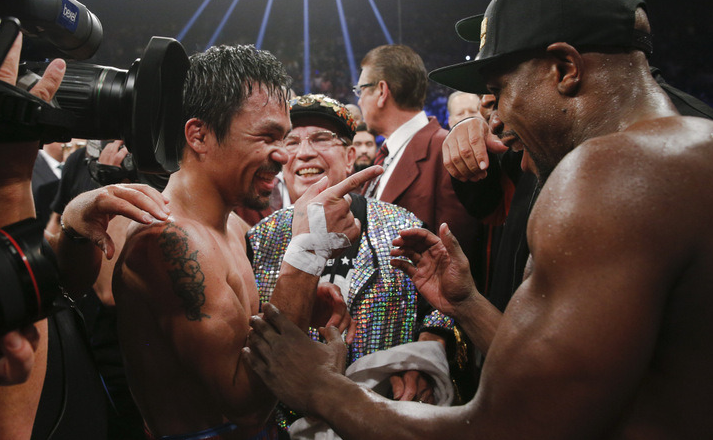 Mayweather earned nearly $180 million and Pacquiao $120 million for their May 2nd fight. Cristiano Ronaldo and Lionel Messi are next on the list. World football has the most members of the top 20, along with NBA Basketball, tied with four apiece. Any MLB Baseball? Why, yes. What? Jon Lester is the highest paid player in the game. For a look at all 100 rankers and their salary/endorsements splits, check out Forbes’ spread, here. 3. Kevin Durant Oklahoma City Thunder SF Washington, D.C.